HUNGRY for more? Receive Teaspoon EXCLUSIVES in your inbox! Two food loving dietitians and moms who blog about tasty recipes and healthy kitchen hacks to make your life easier. I know, I know. We really don’t need yet another recipe for avocado toast. Heck, it’s barely even a recipe: 1) Toast bread 2) Spread with avocado 3) Eat. Small bites are perfect for trying many different tastes. Take tapas style eating outside for al fresco dining or a simple picnic. Or maybe you’re serving small bites at a bridal or baby shower or a graduation party. Show us your healthy take on small plates and finger foods. Gone are the days when I’d elaborately plan out a menu for a celebration dinner, baby shower or having friends over – especially for the appetizers. I ain’t got no time to prep multiple little bite-sized nibbles with super complex instructions at this stage in my life. And these Mini Avocado Fruit Toasts deliver on each of those points. Still impressive – The colors are gorgeous – you’ll score points for Mother Nature’s rainbow. 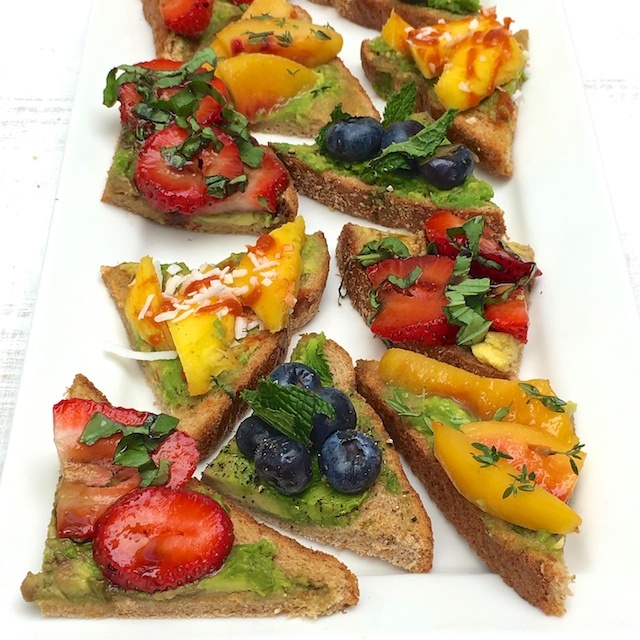 Super easy, colorful appetizers for spring and summer entertaining: Mini Avocado Fruit Toasts. Scoop out avocado into a large bowl, Mash with a fork. Spread avocado evenly over each piece of toast. To assemble strawberry avocado toast, place strawberries on one piece of toast and top with basil leaves and a drizzle of balsamic. To assemble blueberry avocado toast, place blueberries on one piece of toast and top with mint leaves and a shake of ginger powder. 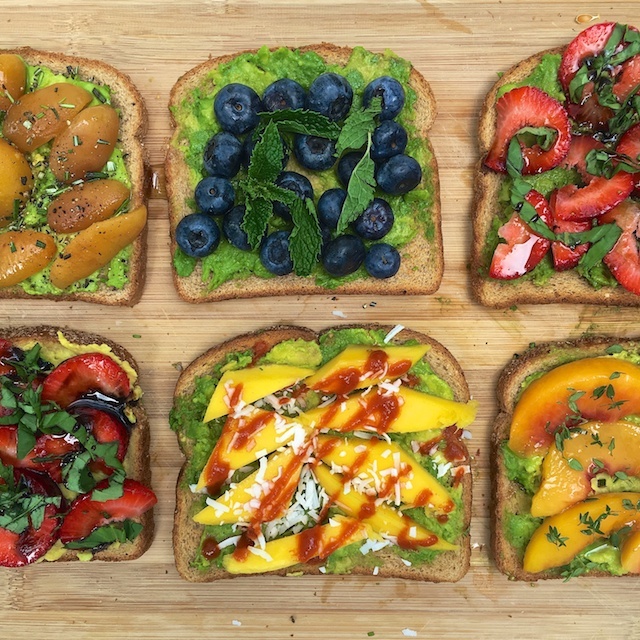 To assemble mango avocado toast, place mango on one piece of toast and top with coconut and a drizzle of Sriracha. To assemble apricot avocado toast, place apricots on one piece of toast and top with rosemary and shake of black pepper. 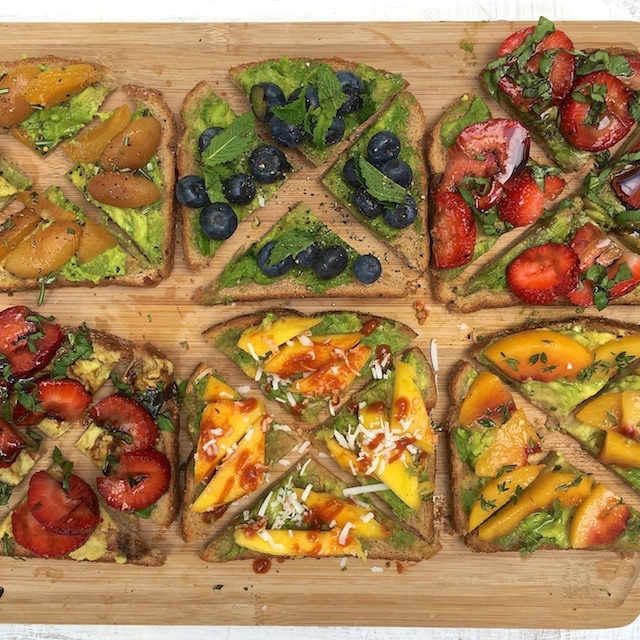 To assemble peach avocado toast, place peaches on one piece of toast and top with thyme and a drizzle of honey. Carefully cut each piece of toast into four triangles using a pizza cutter. Serve immediately. And you could totally make avocado veggie toasts, too! I made a radish + honey + black pepper combo on my 5 Ways To Enjoy Radishes Facebook Live post last week. The possibilities are endless especially with summer veggies coming into season. What do you put on your avocado toast? What are your favorite quick-to-make appetizers? I’m always looking for ideas and if you are too, check out all the ReDuxers small bites/plates ideas below. Enjoy our favorite spring recipes! thanks for such great and creative ideas I would have never thought of this! Love it! Super fun ideas! I just love the versatility of avocado toast! Yum! Thanks much Sara – I love how you did a similar twist with pancakes but went savory too! I absolutely adore this! I honestly can’t pick a favorite combo – they all sound sooo good! And I’m totally w you on keeping apps simple. I make things complicated too often and the truth is a lot of ppl don’t even appreciate the work that goes into it. But #ImAPerfectionist so what can I do?! Lol! Oh I can so relate (they don’t call me #AnalRD for nothing!) But I think I’ve eased up in the kitchen over the years (out of pure necessity as no longer only cooking for me 🙂 And thanks for sharing on IG!! Can never have too much avo toast in my opinion!! Love all of your creative spins/flavors. I am all for easy these days and these do the trick! We’re also moms and business owners who share our family recipes, healthy kitchen hacks and nutrition adventures while keeping it real in the kitchen with you. We’re so glad you’ve stopped by! Don't miss a single delicious, nutritious, food loving recipe. Enter your email address to gain access to Teaspoon EXCLUSIVES! We’re two dietitians who love food as much as you do! 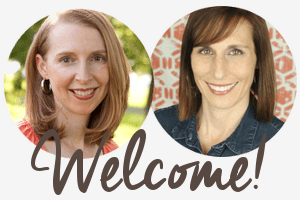 We're also moms and business owners who share our family recipes, healthy kitchen hacks and nutrition adventures while keeping it real in the kitchen with you.